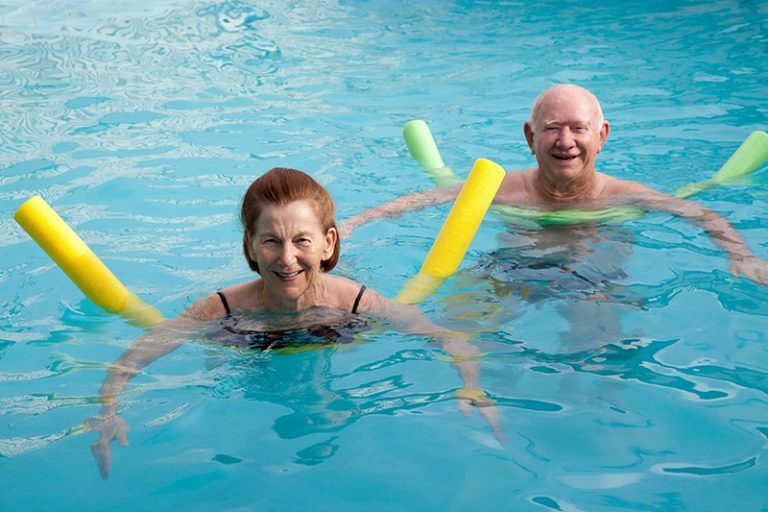 At Hazeldean Gardens, we believe in the importance of seniors maintaining a healthy active lifestyle – not only physically, but mentally and socially. We offer individual and group fitness programs designed by a personal trainer, and aqua-fit classes in our warm salt-water pool. We have an indoor walking track and when weather permits, an outdoor walking path leading to an adjacent park with park benches and a gazebo. To add to the enjoyment of our residents, we have installed recreational facilities in the park including shuffleboard, a golf putting green, bocce ball, and a pickle ball court. There is always something interesting to do, whether it’s one of our regularly scheduled outings, live musical entertainment, a movie in our theatre, a game of cards, billiards, darts, Nintendo Wii, crafts, simply reading a book in our cozy library, or attending on site religious services. Residents are, of course, free to do as much or as little as they please, but our staff will do their best to encourage participation and find something to appeal to every resident’s interests. To encourage socialization, tea, coffee, juice and pastries are served every morning and afternoon in our bistro. There is also a complimentary happy hour every Friday afternoon. Once a month we have a themed special event, eg. St. Patrick’s Day, Victorian Tea, Canada Day, Strawberry Social, Garden Party, Family BBQ, Oktoberfest, Christmas Party, etc. Residents are welcome to invite family & friends at no charge to any of these special events, happy hour, or our daily coffee service. Remember – you’re never too old to have fun. © 2019 Hazeldean Gardens. All rights reserved. I was very impressed with the front staff and management that I spoke with. They were very pleasant and accommodating towards me. Thank you Hazeldean Gardens for your support. Stephanie Jones, daughter of resident Rosemary Langley Hazeldean Gardens, is truely such an ideal retirement residence, we are thrilled that my Mother can call it home. It is family owned and run and this family is caring, professional, respectful and available. All of the staff here are committed to really knowing and treating each resident as an individual . Daily activities are designed to keep everyone mobile and engaged and happy. . There are celebrations, parties , entertainment, games, movies, bus excursions, excercise classes in the activity room and the pool. 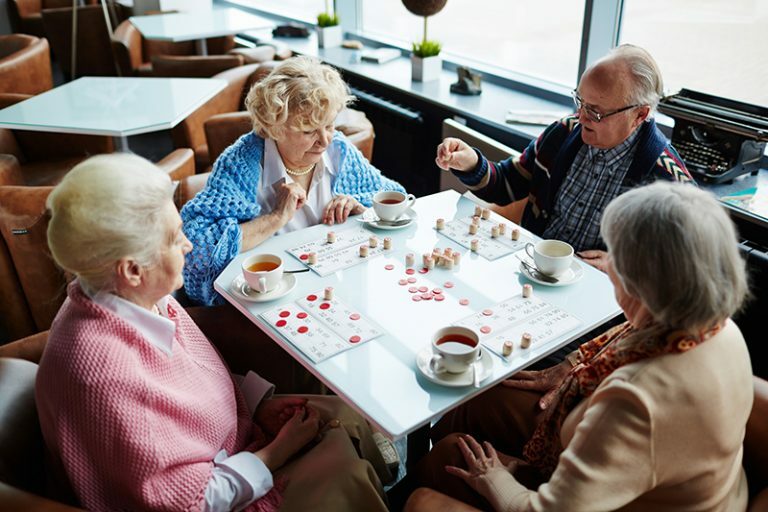 The most well attended activity is the happy hour (after bingo) every Friday afternoon . The star of this lovely home is their amazing Executive Chef , Stephen Gervais, who prepares delicious meals, and goes out of his way to make everyone feel special, and indulge even the fussiest eaters . The Activities Director, is outstanding at his job, and is integral in keeping the programs seamless. His humour is one of the reasons why everyone here always appears happy .Dianne, the General Manager is professional, kind, attentive, approachable, and made the transition of moving very easy.I compliment the owners and their families for being so accommodating, and making the quality of life so much better for all of the residents. The nursing care has been terrific. It is so nice to see my Mother in such a happy, healthy environment. Beautiful, and state of the art retirement residence. The team at Hazeldean Gardens is very easy to work with. Hazeldean Gardens has everything that we were looking for in a retirement residence. From the moment that I walked through the front doors, I could hear laughter and feel the camaraderie in residents, staff and management. There is so much to do if you want to and everything is elegantly appointed. The food is amazing and the dining rooms are so comfortable. Stephen, the chef walks through the dining room during meals to get feedback and actually listens. In fact, everybody, Diane, Chris, Gabe and the people at reception all treat you like family. They pitch in and do whatever it takes to make things work. The dining room staff are so personable and know all of your likes and dislikes.Because this is a brand new building, it is like walking in to your next new home. Everything is bright and shiny. The maintenance staff do such a phenomenal job of keeping everything spotless.We were joking today that it similar to be on a luxury cruise liner without the rocking back and forth.Keep up the good work everybody. Ever since my mother moved in to the residence in Sept 2018, she has been much happier. There are plenty of activities that she participates in and the facilities are exceptional. The facility has 4 elevators so she doesn't have to use the stairs any more when a single elevator breaks down or needs maintenance. There is 100% generator capacity so she can even watch TV when the power in Stittsville is out. We (and many others) have birthday parties in one of the large rooms on the Concourse level where they provide a wide range of services (dishes, coffee, tea, juice, table cloths etc) all at no additional charge to the resident. The food is excellent and well suited to elderly appetites. They even provide a special kind of rye bread that my mother likes for her sandwiches. Stephen (the chef) is fantastic and his meals are amazing. He even made Danish Meatballs for us one evening when he found out that we were from Denmark. The nursing staff (under Brenda) are very helpful (24 hours a day), they have a call button for every resident so they can get help if they need it while on the residence. The nurses dispense medication and monitor my mother so I don't have to worry that she forgot to take her pills (or that she may have taken too many). The cleaning staff are also very helpful and accommodating. Diane (the Manager) meets with the residents every day for coffee and if anyone is having any issues, she knows about it and deals with it right away. Gabe is the activities director and he organizes things and gets everyone involved in the activities. He is a lot of fun. They have outside entertainers that come to sing or play music or just entertain the residents. There are movies in the theatre with actual theatre seating and a large screen, and they provide popcorn. Chris helped us when we first came to see the residence and showed us all the features and explained all the service options. We see him every time we come by and he is always friendly helpful and seems to know all the residents by name. As a matter of fact, all the staff seem to know everyone's name (even ours).All the staff are very helpful and I have never heard any of them say " that's not my job ", whatever you need, they pitch right in and help you even if they are doing something else. The residents are also very friendly, and can be counted on to help other residents when they forget where they are, or where they are going. I only live 10 minutes away, so I can come by frequently and have coffee or play bingo or work on jig saw puzzles or have dinner with my mom.If I could give a six star rating, I would.